Almost every person using a smartphone is an internet addict. Imagine your internet connection has stopped working because of a technical issue or your mobile data pack reaches its free usage limit. If the ISP doesn’t restore the connection within one or two hours or if you don’t buy a new data pack, you may get anxious and annoyed. This is not the only thing that may frustrate you. If the internet connection is fast and your browser is taking several minutes to open a webpage, then you may start cursing the ISP. Being an internet user, you may know that a web browser is one of the most important apps on our phones. Without it, you cannot browse the Internet. If the browser provides basic features and uses outdated technology to render pages, you’ll have a horrible internet browsing experience. In such a case, you must install one of the following best Android browsers on your mobile phone or the tablet. Firefox is one of the fastest browsers for Android. Chrome may have eclipsed the popularity of Firefox when Google introduced it for the Windows OS but FF still remains a great choice when it comes to a web browser. The coolest thing about Mozilla Firefox is that it lets you install plugins. If you use Firefox on PC, you may know that Firefox gives you access to over 1000+ plugins. Option to open a website designed for the desktops. Option to bookmark a website. Private browsing and tracking protection. 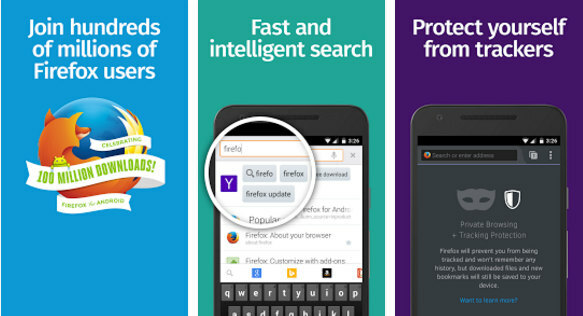 Firefox is one of the best Android browser apps. It is not a memory hogging application and works great on Android OS. 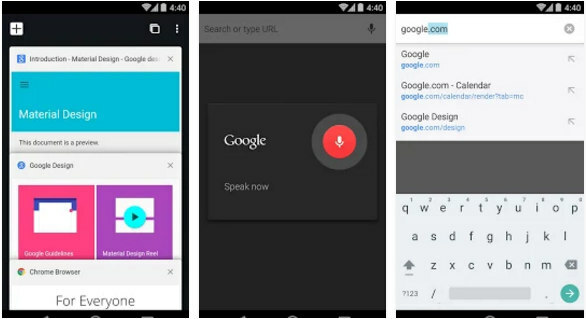 Chrome is an Android browser that needs no introduction. It a reliable app to surf websites, watch videos embedded in pages, etc. Chrome is a browser developed on the source code of Chromium open-source browser. It has a powerful engine which opens a website within 2 to 3 second you type its address in the address bar and tap on the enter button. Chrome provides a data saver utility. It also provides safe browsing function, which alerts the user when they try to open a harmful website. Like Firefox, GC supports tabbed web browsing. It has a special module called InCognito mode. When you’re browsing in this mode, the browser won’t record your history. Blazing fast with nice UI. Option to enable data saver. Requires up to 40% more system memory than Firefox on some devices. Opera was the most used mobile phone browsers until Google launched the Android OS and the Play Store. It has evolved from a browser with basic functionalities to a browser with fantastic features. The web browser is available in two forms on the Play Store. 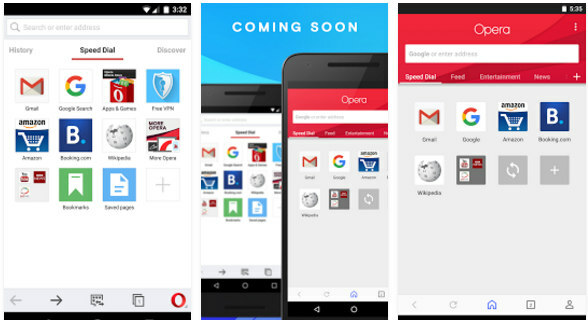 If you own a low-end mobile, download Opera mini else you must use the other variant of the browser. The application comes with an annoying feature called discover that opens thumbnails of news websites you’ve never heard of. You can ignore the discover tab but this feature of Opera wastes the precious data of the user. Like Chrome, Opera offers a data saving function. It allows users to switch user agent i.e. open desktop website. The most impressive feature of Opera is its ability to wrap text content when the user zooms the page. Opera turbo that improves the speed of the website considerably. The bottom toolbar looks annoying. Opera has more pros than cons. It is one of the most downloaded and top rated browser apps for Android devices. UCBrowser is one of the fastest browsers for Android. Unlike other apps which don’t require special permissions, UCBrowser prompts users to enable phone call management permissions for it. UCBrowsers also asks you to enable permission for accessing your documents, media, and other files. UCWeb, the developer of this app has configured UCBrowser to open the UCNews portal on startup. Many users expect the browser to open a blank page but this is not the case with UCW. UC web browser lets you change the default search engine quickly. 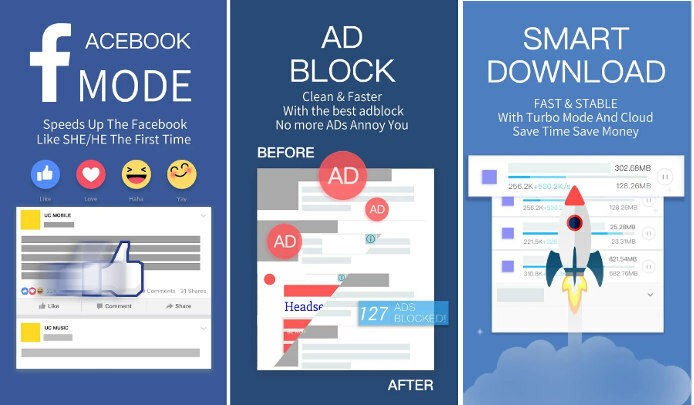 It supports text-wrapping and comes with an AdBlock tool that works like a charm. UCW is one of the best browser apps for Android. Special gestures for video playback. Night mode to make reading articles on a website in a dark room easier. Smart downloader, easy to navigate. Saves data with a unique compression function. Special facebook mode which speeds up facebook. What have I mentioned only four Android browsers? Guys, every time I download an alternative app for my favorite browser i.e. Firefox, I find the find the new application annoying. After using the new browser for a while, I switch back to FF because no other browsers provide as good user-experience as it. Firefox supports extensions. Hence, you can install a VPN, data saver or whatever you want. I have used Chrome, UCW, and Opera in the past and found them fast and reliable. The above best browser apps for Android are unbeatable. Their userbase will keep growing unless a developer launches something different. Don’t waste your time in downloading apps than the ones which I have mentioned above. If you’re looking for an alternative to the above apps, try out Puffin, Firefox Focus, and Cheetah Mobiles ArmorFly browsers. Conclusion: A perfect browser app is one which opens various types of websites in no time on fast internet connection. If the connection speed is poor, it should allow users to turn on the data compression function. This feature helps browsers in rendering pages quickly. The apps we’ve shared above score 4 or 5 in each department. They are free and reliable.